Choctawhatchee Bay is a popular boating spot for those renting pontoons. Use these five tips to navigate the Choctawhatchee Bay in Destin in order to have a safe and memorable time. Many people are surprised to learn just how big the Choctawhatchee Bay really is. It is more than four miles wide in some parts, and it is a staggering 30 miles in length. This is no small lake; it’s a serious body of water! Because of the size, it is critical to know where you are in Choctawhatchee Bay at all times. A chart can be very handy, particularly if you're unfamiliar with the area. 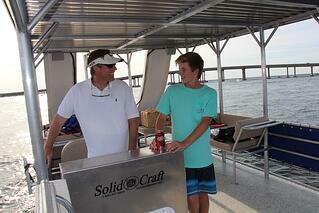 Many boat rentals in Destin provide nautical charts of the area. In addition, keep your eyes out for major landmarks. Knowing what the Destin Pass looks like, for instance, can prevent you from heading out into the Gulf of Mexico, where safety can be a serious concern. When in a channel which is marked by aids of navigation, stay to the right so the oncoming boat passes on your left (port) side. When crossing a channel, the vessel in the channel has the right of way. Let the oncoming vessel pass and go behind them. When passing a slower boat in the channel, pass to the port side but be aware that their wake gets bigger the closer you get to the boat and it can be dangerous. Generally speaking, it’s better not to pass at all while in a channel. Always look around you for other boats who may not know the navigation rules or who may not be driving safely. Closer to the shoreline, and when you are near to hotspots in Destin like Crab Island, you may see signs that ask you to monitor or adjust your wake. This is a less of a problem in a pontoon boat, since speeds typically don't get as high. However, they are still something you should pay attention to. If a sign says to slow down and create minimal wake, then you'll want to lower your speed and be aware of your surroundings. If a sign says no wake or idle speed, then you should lower your speed as much as possible while still moving forward. One of the great things about Choctawhatchee Bay is the freedom to explore the bay in its entirety. As long as you avoid leaving through the Destin Pass, you'll be in a relatively contained, safe environment. However, it can still take upwards of an hour to cross the bay. Rather than wasting time, especially if you're in a rented vessel, make sure you know where you're headed, and how to get there, in advance. Whether you're planning to spend the day near Crab Island or try fishing in one of the coastal bayous, you'll need to know how to anchor your boat. Even in shallow water, anchoring is a necessity for safety reasons and to ensure you don't move too far off your course. To safely hold your boat in place, it is important to put out enough anchor rope, called rode. A good rule of thumb is to maintain a 5:1 – 7:1 ratio of rode to water depth. The harder the wind and faster the tide, the more rode you want to let out. If you're renting a boat in Destin, just ask to be taught how to anchor your boat. Anchoring a pontoon boat is a breeze once you have seen how to do it! With these tips in mind, you'll be ready to navigate the Choctawhatchee Bay. If you're planning to rent a boat on your next trip to Destin, check out the double-decker pontoons for rent from Double Fun Watersports. These unique pontoon boats have two decks and two water-powered slides that your entire group will enjoy.